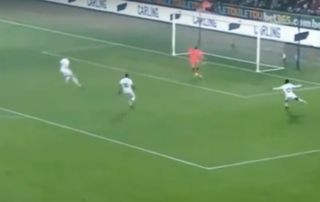 Petr Cech has gifted Swansea City one of the most ridiculous goals you’ll see this season as the Arsenal goalkeeper’s mis-kick allowed Jordan Ayew to score. The goal makes it 2-1 to the Swans at the time of writing, with Arsenal facing yet another away defeat in the Premier League, having won just three times on the road all season. No wonder Arsenal face the prospect of ending tonight in sixth place, with the club in a dire situation again thanks to a lack of basic nous at the back. A poor throw taken too quickly by Nacho Monreal put Shkodran Mustafi under pressure, and the German then arguably over-hit his pass back to Cech in the area. Still, the Czech Republic international could still have done better, but mis-timed his clearance straight into the path off Ayew, who had an easy job of finding the back of the net from close range.